The treatment of cataracts involves the replacement of the clouded natural lens in a patient's eye with an artificial lens known as the intraocular lens (IOL). Of all the FDA approved IOL, only Crystalens® is not multifocal or monofocal. Crystalens is the only FDA approved accommodating IOL in the U.S. Accommodation is explained as the ability of the natural lens of the eye to vary focus with normal effort as the distance of focus varies. That is, when you look at a tree in a distance or your fingernails or even the license plate of a vehicle, all are in focus without an effort from your side when looking through a healthy eye. The human eye is capable of bringing into focus distant and near objects by varying its curvature to match the distance. In the eye, around the lens is a circular muscle called the ciliary muscle which is attached to numerous fibers. These muscles contract to focus an image at a far distance (become steeper) or relax when the object is near (becomes flattered). During the process of laser cataract surgery, the natural lens of the eye is removed and with it goes the accommodative ability. There are many IOLs which mimic the accommodative ability of the natural lens. Only the Crystalens actually moves to change focus in a more natural way to mimic ourt natural ability to focus on near and intermediate objects. Unlike other IOLs, Crystalens has no steps or concentric grooves. As the focus is changed from near to far, the mobility of the ciliary muscle remains intact, the Crystalens moves accordingly, flexing forward when patients focus at close. As the muscles relax for distance vision, the lens resumes its natural, neutral position. For distances which are not too far or close, the movement is minimal. Crystalens was approved by the FDA for the treatment of cataract in 2003. In 2008, Bausch &Lomb, the developers of Crystalens, released an improved version called Crystalens AO™. The new lens offers improved depth perception and clearer short vision without interfering with other distances. The procedure of laser cataract surgery remains the same regardless of the IOL type used. The first step involves making a small incision along the edge of the cornea. Then an ultrasound probe is inserted through the incision to fragment the natural lens. A gentle suction removes the natural lens of the eye, where the cataract is forming. 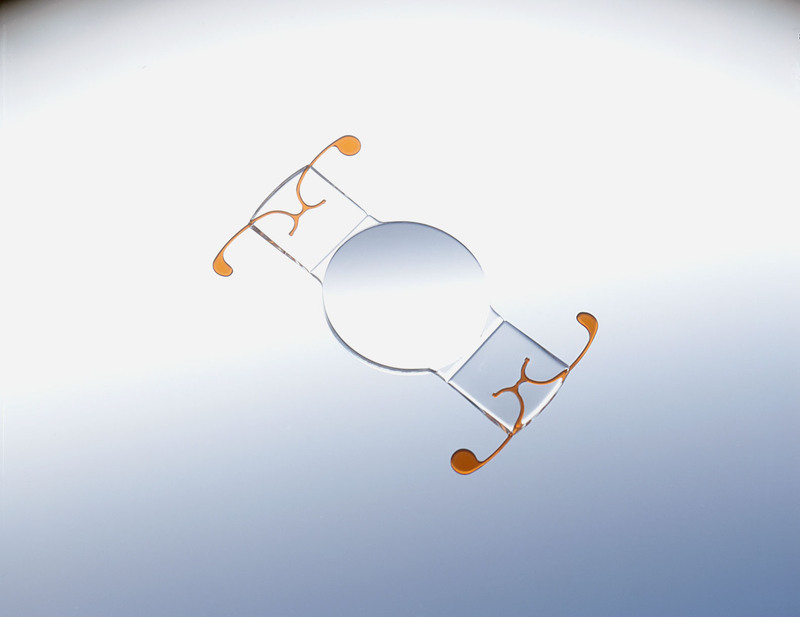 The Crystalens is then inserted as the replacement lens in the same manner that any other IOL would be placed. As the patient heals, the muscles in the eye begin to strengthen, and the Crystalens flexes more and more, allowing a larger range of focus and better intermediate and near vision.